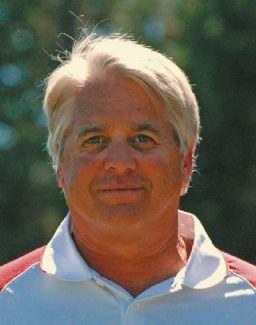 Steve Baird who ran as a Democrat for State Senate, before withdrawing in February, had previously run as a Republican. In his short campaign, Baird listed his Top 10 initiatives as being a guaranteed minimum universal income of $50,000 for all, voting rights for everyone living in California and "late term abortions up to and including the 25th year." Baird's name is on the election ballot, though Truckee's Silke Pflueger is the only Democrat remaining in the race. 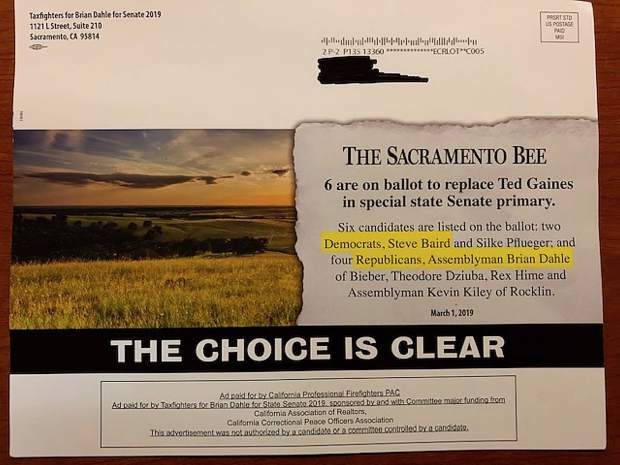 Taxfighters for Brian Dahle for Senate 2019 recently circulating a mailer supporting Dahle, highlighting his name as the choice for Republicans and that of Steve Baird as the choice for Democrats -- though Baird withdrew from the race in February. 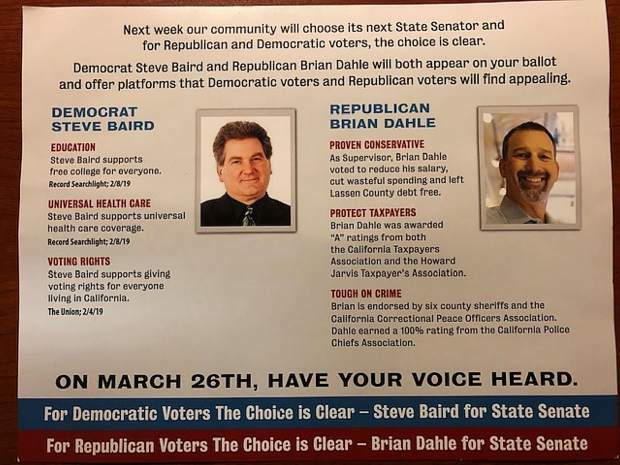 A recently released political mailer urging support for Republican state Senate candidate Brian Dahle also suggests Steve Baird as the “clear” choice for Democrats in Tuesday’s special election for the District 1 seat. Although Baird dropped out of the special election race in February, his name remains on the ballot. The advertisement was paid for by Taxfighters for Brian Dahle for State Senate 2019 and the California Professional Firefighters PAC, with “major funding” help from the California Correctional Peace Officers Association and California Association of Realtors, which has donated $150,000 to the committee that funded the mailer. 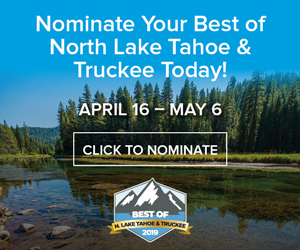 One Democrat, Truckee’s Silke Pflueger, remains in what’s now a five-candidate race, with Republicans Theodore Dziuba, of Placerville; Rex Hime, of Sacramento; and Kevin Kiley, of Rocklin, in the race alongside Dahle, Nevada County’s District 1 Assemblyman. With California’s top-two primary system, if no candidate garners 50 percent plus one vote, the top two vote-getters — regardless of party affiliation — will advance to a June 4 runoff. Dahle told The Union he had no connections to “Taxfighters for Brian Dahle,” and that he had nothing to do with the advertisement. And, Dahle said, although Baird announced he’d withdrawn from the race, his name is still on the ballot, so people can vote for him. “People that have died while on the ballot have won, in some cases,” he said. Grass Valley resident Kathryn Davis called Baird an active Tea Party representative, and having run as a Democrat iun this election cycle was acting as a spoiler in the special election for the Senate seat. “It’s sort of painting the picture of the race that is totally inaccurate,” said Davis. “It just seems really unethical,” adding that Dahle should publicly disavow the mailer. Before running and dropping out of the special election, Baird ran as a Republican for the same state Senate seat in 2016, then held by incumbent Republican Ted Gaines. Last November, Gaines won election to the state Board of Equalization, which led to the special election to fill his Senate seat. In his previous run for state Senate, Baird said he would be considered a “climate change denier,” noting he believes reports of climate change both in the government and the media are based on “false science,” and that the earth has historically cycled between warmer and colder periods. An an April 2016 candidate forum, he told Nevada County voters that legislation creating the State of Jefferson, breaking off a portion of Northern California as a 51st state, would be among the first bills he’d attempt to pass, if elected. Baird did not return phone calls seeking comment for this story. 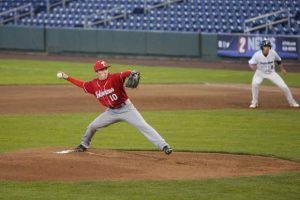 Dahle has represented District 1 in the state Assembly since 2012, when he advanced from a five-candidate race into the top-two primary against Republican Rick Bosetti, whom he defeated with 65.6 percent of the vote. Dahle totaled more the 70 percent of the vote in 2014 and 2016, before being re-elected in November with 64.2 percent. He served as minority leader of the Assembly from September 2017 to November 2018. Though he said he had no involvement with the mailer and it states “This advertisement was not authorized by a candidate or a committee controlled by a candidate,” Dahle has been endorsed and financially supported in his campaign by the California Professional Firefighters PAC ($9,300), which, along with Taxfighters for Brian Dahle for Senate 2019, is stated to have funded the mailer. Taxfighters for Dahle also produced video advertisements posted on social media, that includes footage of Dahle and his wife, along with clips of the candidate talking with constituents. 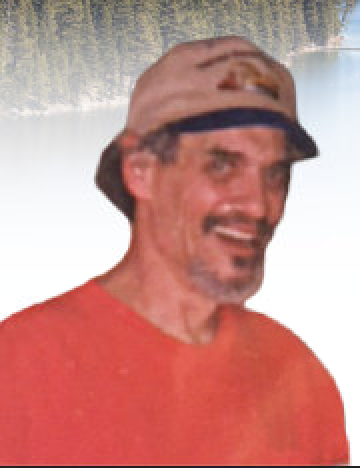 Dahle said information about him used by the group, including video, came from his public website. Stock video footage, looping from various angles and without audio, is available under the “Media” tab of the website. According to the Secretary of State’s office, the committee “Dahle for Senate 2019, Sponsored by the California Correctional Peace Officers Association; Taxfighters for Brian” has received $299,000 in contributions during the Jan. 1-March 9 filing period. 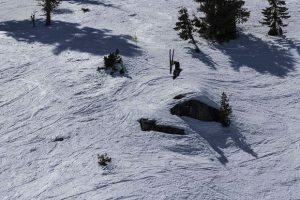 Of that, $150,000 came from the California Real Estate Independent Expenditure Committee of the California Association of Realtors. The Taxfighters committee spent $208,365.47 during the period, of which $125,151.33 was paid to “Misfit” for radio, television and website work, according to campaign filings. Contacted at the number filed with the Secretary of State’s Office, Nicholas Sanders, an attorney with the Taxfighters for Brian Dahle for Senate 2019 committee, would not comment on the mailer, but said he’d refer the matter to the committee. The Union has received no response to a request for comment. Contact Sam Corey at 530-477-4219 or at scorey@theunion.com.